Give seeds just a few simple ingredients, and they’ll create gorgeous flowers. Which you can then plant all over your yard. Or a consistently bright, draft-free window or other light source. 1.) Choose the time for planting indoors based on the outdoor transplant dates. The packets will tell you when this is. For more information about your zone and when to transplant outdoors, go to the USDA Plant Hardiness Zone Map. It’s an interactive map with lots of different colors for each growing zone in the U.S., and you can click deeper and deeper into your zone for all kinds of information. The packet says, “plant indoors six to eight weeks before last spring frost.” Find your zone and the usual date of the last frost. (For most zones this is any time from March–in the way South–to June–in the way north.) Go to your kitchen calendar and find the last-frost date. Then, count backwards six to eight weeks. There – you have just arrived at the starting time. And many, many plants have virtually the same outdoor transplant time, so it’s not like you’ll have to keep a scientific chart for all this. The main idea here on the correct timing is to have those little plants ready to go straight outside as soon as the weather permits. 2.) If you are using sectioned plastic flats, place them in plastic trays that are made to be used with the flats. These also should have clear plastic covers. Fill the cavities with sterile soil mixture. (DO NOT USE POTTING SOIL). Completely moisten the starting medium. This can be a little messy, so plan likewise. Also, allow time for the starting medium to absorb the water. It shouldn’t be muddy, just very moist. If you are using peat pots or peat disks, those also must be moistened. Set them in rows to fill a tray. Fill the peat pots with sterile soil mixture and moisten well. Fit peat discs in rows, side by side, into plastic tray and cover them with water, they will plump immediately. This also can be messy, so provide for spills. If you use loose soil mixture, place it in a flat with divisions and plant only one to two seeds per division. Remember to moisten the soil before planting. You can also sprinkle seeds onto the starting medium in an un-divided container of any kind, but I’ve found these are difficult to separate and you can easily injure the tender shoots. No matter what medium you use, you MUST water first. If you try to water after planting, you’ll disturb and possibly wash them away, especially if they are tiny. HINT: You’ll find that the plastic trays will accommodate about 70 peat disks apiece. The divided flats have 72 spaces each. Depending on what you want to grow, you could have different plants in one tray. They all need the same or very similar ingredients in order to germinate. 3.) Next, open seed packets — one at a time. HINT: If you have rooting compound, dust seeds with a TINY bit before placing them in the peat pots or plumped up peat disks. To do this, pour seeds into a small bowl or cup. Add a pinch — less than 1/8 teaspoon — of rooting powder. Spin or stir the seeds until each is coated. Rooting powder will encourage quick germination and root growth. 4.) Make a hole in the starting medium with a pencil eraser. Use tweezers to pick up seeds, one at a time. Place the seeds — one per division or peat disk or peat pot — in at the correct depth. Even if it seems you’re just laying some on top of the growing medium, don’t worry. They’ll sprout. HINT: Try to resist putting more than two seeds in one pot or disk. You’ll almost always have more seeds than you need, but that’s okay. Fold up the envelope and put it aside. 5.) Next, identify what you just planted with some kind of label. 6.) Cover the tray, using either a clear plastic cover that should come with it. 7.) Place trays on the shelves of an indoor greenhouse. Turn on the lights and the timer right away, with the light source about an inch from the clear plastic tops of the trays. 8.) 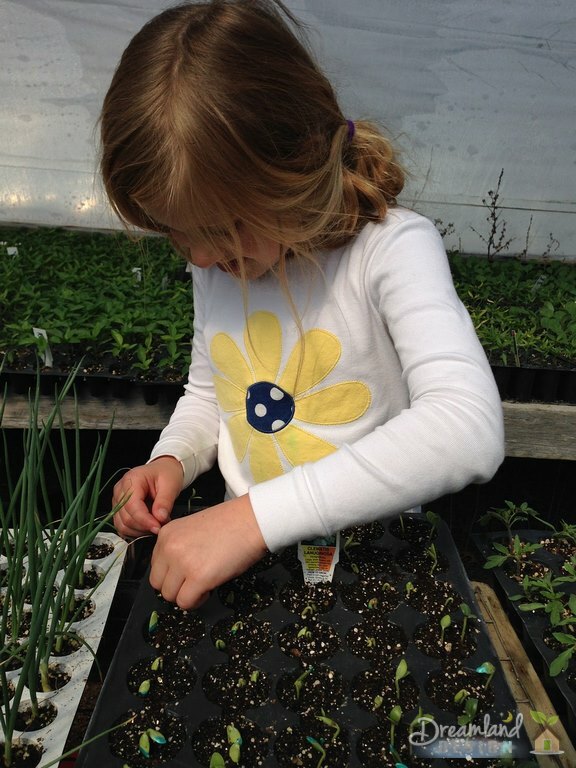 If you are not using an indoor greenhouse, choose a consistently warm and sunny spot for the seed flats. 9.) In five to ten days, you’ll see tiny green sprouts appear. Once a majority has sprouted, remove the clear plastic cover to let in air. 10.) Flats should not need water right away, but NEVER let them dry out. Check the soil moisture at least once a day. If you’ll be unable to do this for a couple of days, put the covers back on to conserve moisture. Water the flats when the surface of the planting medium looks dry and feels less moist. A watering can with a very gentle sprinkler head is recommended. Harsh streams of water will damage and disturb tender shoots. If possible, water from the bottom. Use a large turkey baster to remove excess water from seed trays after watering. Don’t let them stand in water. 12.) In about four weeks, apply a weak fertilizer solution (about 20 percent). 13.) In about six weeks, when sprouts are three inches to six inches tall, begin feeding with a 50 percent solution. After that, they should be ready to transplant, if the weather cooperates in your zone. There’s no secret to starting seeds successfully, but there are a few tricks. I’ve mentioned some above. I’ll repeat them here, plus add some others I’ve picked up. First, take care in the planting medium you use. Make sure it is sterile and made for starting seeds. If the medium isn’t sterile, seeds won’t germinate or the sprouts will die from “damping off.” Most importantly: DO NOT USE POTTING SOIL. It is too dense and isn’t sterile, meaning it will have diseases and, perhaps, insect larvae that will attack sprouts. I have had great success with compacted peat disks, which expand with water. They become self-contained little “pots” and can be placed directly into the ground or into containers when sprouts are ready to be transplanted. Second, be sure to follow the planting-depth recommendations. If a packet says “plant at 1/8 inch depth,” that’s what it means. For comparison, a pencil eraser is about 1/4 inch. Third, consistently provide warmth, water and light. (This is why I recommend an indoor greenhouse.) If you don’t use an indoor greenhouse setup, make sure you provide the necessary conditions by means of a south-facing window, proper warmth and adequate water. Check flats daily and keep the soil moist, but not wet. Fourth, peat disks are less messy and easier to handle than loose soil mixtures. My germination rate with peat discs has been nearly 100 percent. And the ease of transplant makes them a good choice, as well. Achillea (Yarrow) — Good germination, produces lovely feathery leaves and copious flower heads made of tiny blossoms that the butterflies adore. It’s a perennial that spreads each year and can be divided for new plants. Coleus — Very easy germination. A lovely annual with gem-colored leaves, great for shady spots and mixed with impatiens. Echinacea (Purple Coneflower) — Slow germination – two or more weeks – must completely worth it. This hearty perennial is lately available in oranges, yellows, bright pinks and even reds. Impatiens — Easy germination and produces lots of easily transplanted annuals that provide terrific for color in even deep shade. Lavender — What’s a garden without lavender? This scrumptious perennial smells wonderful, asks little care, can be divided and makes heavenly dried flower arrangements. Plus, the bugs and varmints leave it alone completely. One note about lavender seeds: keep them moist and be patient while they take 10 to 14 days to sprout. Marigold — Great germination and healthy, unfussy plants. Among the most reliable annuals in the garden and a great project for kids. Painted Daisy — Good germination, and produces a lovely delicate-looking plant with white, pink and crimson daisy-like flowers. It’s a very hearty perennial and takes little care, but will spread and can be divided. Petunia — Great germination rate and produce some of the most beloved and lovely summer annuals. Salvia — Good germination, and produces lovely spikey flowers that mix well with many other types. Comes in many colors, also. Some types are perennial in some zones. Shasta Daisy — Easy germination, and produces many-branched plants full of yellow-centered, white-petaled flowers, which the bugs don’t bother. A perennial in some areas. Viola (Pansy/Violet) — Germinates easily and is a stand-by for cooler zones and during the transition seasons of early spring and late fall, when color is so appreciated in the garden. Violas come in many colors – orange, purple, yellow, white, tri-color – but don’t forget the lovely little “Johnny-Jump-Ups,” too.